I used to like French people. Certainly I like French literature, French film, French art, and bits and pieces of French music, too. But I also used to like French people, so much so that I grossly overrated the film "Amelie." That was back in 2001 or so. I’m not sure what happened since. Before the neighborhood where I live was overrun by trust-fund hipsters and young semi-professionals subsidized by real-estate-value-inflating parents, it was semi-overrun by French people who are still around, and who, like the aforementioned trust fund hipsters and young semi-professionals, seem to be under the impression that they and their small children are so blessed and wondrous that nothing else in their immediate vicinity actually exists. So I’ll be sitting in a local eatery and have my foot stepped on by a five-year-old French person whose parent will either act as if nothing at all has happened, or expect me to act as if having my foot stepped on by a five-year-old French kid is the most blessed thing that will happen to me all day. Maybe that’s where it started. I bring this up as a way of explaining my very negative reaction to "Chinese Puzzle," the latest film from writer/director Cedric Klapisch and the third part of his ostensible "Auberge Espagnole" trilogy. Said trilogy, which began with 2002’s "L’Auberge Espagnole" and continued with 2005’s "Les Poupées Russe" ("Russian Dolls"), finds its protagonist, French dude Xavier (Romain Duris), spending large portions of time outside of his native France pursuing life, liberty, and romantic/domestic fulfillment. In the first movie, he was in Spain, the second in St. Petersburg, and here, the newly-40 Xavier takes Manhattan, specifically Chinatown, where the women in his life who had been introduced in the prior films—wife and mother-of-his-children Wendy (Kelly Reilly), and unusually-disposed ex-girlfriends Isabelle (Cecile De France) and Martine (Audrey Tautou)—all converge too. The film’s opening moments, in which Xavier hustles his kids through busy New York streets, directing them in loud French, had an uncomfortable vibe of undesired verisimilitude for this viewer, along the lines of "Oh, no, ANOTHER one?" I know: it’s only a movie. But it’s also only a movie that glories in the worst and most unexamined bourgeois-bohemian clichés, concocting for its protagonist a midlife crisis in which everybody is attractive and smart and nobody ever goes wanting in spite of constant complaints about being broke. After the breakup of his marriage to Wendy, Xavier impulsively follows her to New York, for the kids, you know. Isabelle, now a lesbian, has taken a Wall Street job and has used Xavier for a sperm donor. Maybe I’m more bohemian than most French people, because by this movie’s lights, being a sperm donor is a really big existential deal that involves breaking confusing news to your other children and pouting a lot. Silly American me, I thought it was a relatively routine thing. Any way. There’s also a scene where Xavier, hard pressed to exert his rights as a dad, goes to a storefront law firm to discuss his options with a "colorful" New Yawk solicitor. Now I don’t want to come off as one of those cats Alfred Hitchcock disdained as a "plausible," but what do you think the odds are that a relatively successful French novelist (for that is what Xavier has become), upon relocating to New York, will not be able to connect with a somewhat more distinguished practitioner? Pretty bad. 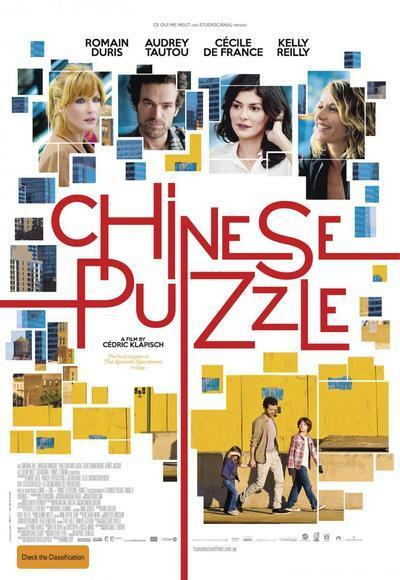 But "Chinese Puzzle" uses Xavier’s "complicated" (that word comes up an awful lot throughout) situation as a pretext to establish his bonafides as a funky soulful French dude, a guy who doesn’t even need a steel frame or box spring when he sets up his bedding in his modest new Chinatown flat. It’s lucky that Klapisch has an actor as disarming as Duris playing Xavier, or else the character would be completely insufferable, never mind just intermittently so. The rest of the cast is equally attractive, and the New York settings are mildly unusual. But the movie is so relentlessly self-satisfied in its celebration-of-life wisdom that the charm of its particulars never grabbed me with any kind of consistency, leaving me to write cranky notes about how the movie was "‘Late August, Early September’ For Dummies," and other unkind things. If you live in a neighborhood uninfested with French people, your mileage may vary. But I kind of doubt it.